Are you tired of going all the way out to Vashj’ir for those pesky Night Elf dig sites? 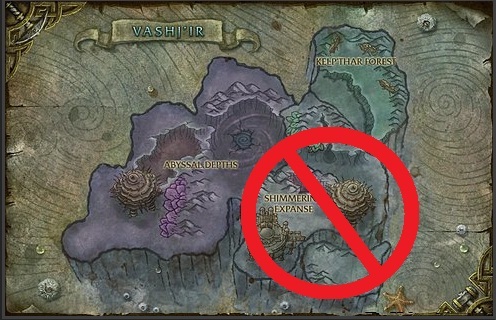 Blizzard has removed Vashj’ir from your Dig Site table, you’ll no longer have to survey that zone again. Hotfix: For those still leveling Archaeology, you’ll now be given triple skill gains for making Rare Artifacts. We will be performing urgent maintenance on all realms to resolve a technical issue. Maintenance will begin at 5:00 AM and conclude at approximately 11:00 AM PST. The search radius to find an Archaeology node from the Archaeology ability Survey has been increased. This will result in fewer searches needed while in the “green” range of surveying. Update: It seems that they made it so that nodes (fragments) can be discovered at a larger range. It used to be the would always spawn within looting range. Now they can be discovered a little farther away meaning fewer repeat green surveys.